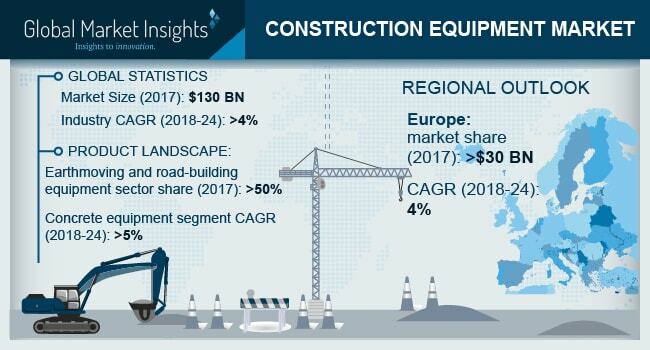 Construction Equipment Market size is set to exceed USD 170 billion by 2024; according to a new research report by Global Market Insights, Inc.
Government organizations focusing on replacing the aging infrastructures with sturdy modernized structures will propel the construction equipment market growth. The construction sector is witnessing increasing investments from several government organizations for the country’s overall economic development. For instance, the Russian government is focusing on the development of affordable housing for the low and middle-income groups. Through the Make in India initiative, the Indian government is also stressing on developing the country’s infrastructure. The growing telecom, energy domain, and the smart city initiatives for the realization of connected cities will boost the construction equipment market growth. The incorporation of the latest advanced technologies into the equipment ensure fast and smooth operation of the machines, fueling the construction equipment market growth. GPS, telematics, and remote tracking are the latest technologies integrated into the machinery to enhance their features. The development of advanced sensors that enable real-time tracking of machinery will further support the industry growth. Embedded sensors are being inscribed in the equipment to enable the tracking of these instruments, tracking the fuel consumption, and controlling the gas emissions. Rapid urbanization is a key factor boosting the construction equipment market growth. Large population shifting to urban areas for employment will spur the demand for advanced machinery that facilitates fast & efficient completion of high-rise buildings. The creation of smart cities that demand high precision in building activities will further support the industry growth. In addition, the lack of the availability of inexpensive labor to suffice the demand for increasing residential & commercial construction activities will boost the market growth. Factors, such as high operation and maintenance cost of equipment, will hamper the construction equipment market growth. Stringent government regulations pertaining to hazardous gas emissions are compelling manufacturers to keep a track on the operation of the machinery, thereby increasing the maintenance costs. Small-scale infrastructure projects are still adopting traditional manual techniques due to budgetary constraints. However, with the introduction of stringent rules pertaining to the safety of operators at the workplace, the industry will witness growth. Earthmoving & road building machinery market is estimated to grow at around 4% CAGR from 2018 to 2024. The growth of the equipment that can be attributed to the increasing large-scale infrastructure projects across the globe. Rapid urbanization has contributed to the demand for sophisticated machines for residential & commercial projects. The rise in the urban population has put a tension on the existing services such as road networks and public transport. Furthermore, the advent of smart concrete materials will support the concrete equipment industry over the forecast timespan. Excavators are increasingly being used for below-ground operations and surface level operations, surging their demand for building & mining activities. The construction equipment market size in Europe was over USD 30 billion in 2017 and is anticipated to grow owing to the increasing focus of several government organizations on the refurbishment of the existing infrastructures. The growing significance of smart connected cities will favor the industry growth in the region. In terms of residential construction, 2017 was a record year in France with 497,200 dwellings receiving authorization for the construction in 2017 and 418,900 commencing the construction. Several countries in Europe recovering from the financial crisis will provide growth opportunities for the construction equipment market growth. The government of UK is also implementing steps to support local players, who have the potential of expanding in the international markets. Key players in the construction equipment market are Volvo Construction Equipment, Caterpillar, Inc., Komatsu Ltd., Sany Group, Zoomlion Heavy Industry Science & Technology Co., Ltd., Terex Corporation, Liebherr Group, Hitachi Construction Machinery Co., Ltd., XCMG Group, and CNH Industrial. The construction equipment market is slightly fragmented with few companies holding a dominating market share. The industry is characterized by new product launches with companies focusing on introducing new solutions with advanced features to enhance the offerings and expand their footprint. For instance, Topcon Positioning Group announced additional features to its asphalt paving system with new components that encompass anti-vibration slope sensor and a tracker. Furthermore, attractive growth opportunities in the sector coupled with the support of the government is facilitating the entry of new players in the construction equipment market.